A fantastic early learning sticker activity book all about animals, for children aged three and over. Little ones with love the photographic activities and picture puzzles! Great for introducing key first concepts, while having fun at the same time. 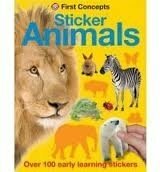 With over 100 animal stickers to complete the puzzles, scenes and activities.